I made these for my family this week, with my 2 daughters in mind, both working very physical jobs this summer, and one whose weight is lagging behind. I used to make these for my son when he was a small boy. He loved them! I made them a few times when my daughters were small, but for whatever reasons, I stopped making them. I had been pricing "energy" products that would be easy for my daughters to grab on the way out the door in the mornings, things they could eat either as breakfast, or as a snack later in the AM. You can buy cheapie granola bars for about 20 cents each. Or, those Kind, but not-so-kind-to-your-wallet, bars for over a buck each. I was specifically looking for a high quality, nutritious, protein-dense bar or product, so that puts me at the high end of the price spectrum, unfortunately. That's when I pulled up a couple of old recipes from years' past. I priced out my ingredients, shopping 2 different stores (plus my pantry), to get the best price possible for my area. I found powdered milk at Fred Meyer (and with the Senior discount, to boot! ), and honey and raisins at Cash & Carry. I had peanut butter and granola at home. 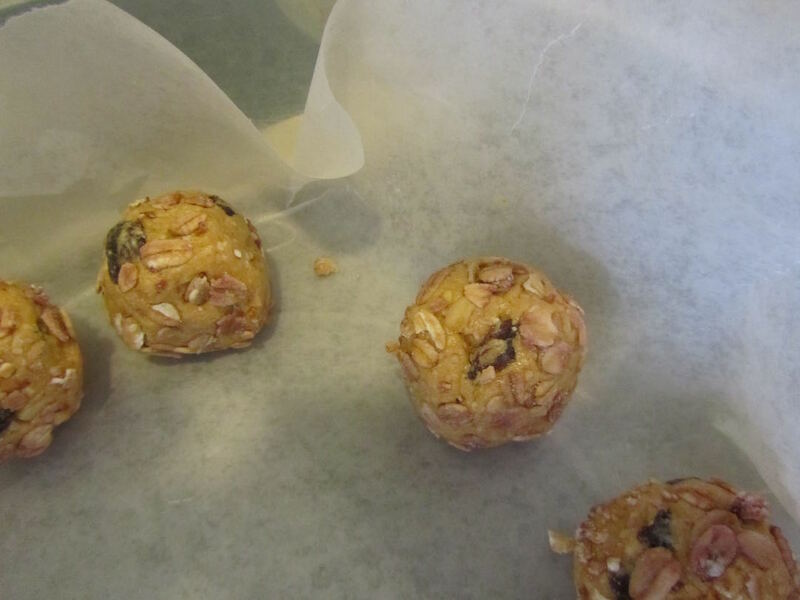 My complete cost to make 1 batch of 24 of these little energy balls (including ingredients I had at home) was $2.12. That works out to almost 9 cents per 110 calorie ball. Those cheapie granola bars have about 90 calories each, at 20 cents. As I was specifically looking for protein, I also compared protein values between cheapie granola bars and my Peanut Butter Energy Balls. A small, 90 calorie granola bar contains 1 gram of protein. My homemade balls have 3.3 grams of protein each, over triple the store-bought item. It's not entirely fair to compare Kind bars to peanut butter balls, as Kind bars are fruit and nut bars. However, stay tuned. I'll be pulling out my fruit and nut bar recipe next week, and give you the cost breakdown then. You just knew that was coming, didn't you?! *if you are using instant powdered milk, you'll want to measure it, then run through a food processor to break down the tiny bits into a finer powder, before mixing with peanut butter. It doesn't need to be perfectly ground, just mostly so. Non-instant dry milk is a fine powder, mostly available in health food stores, and often used in baking (adding to doughs). 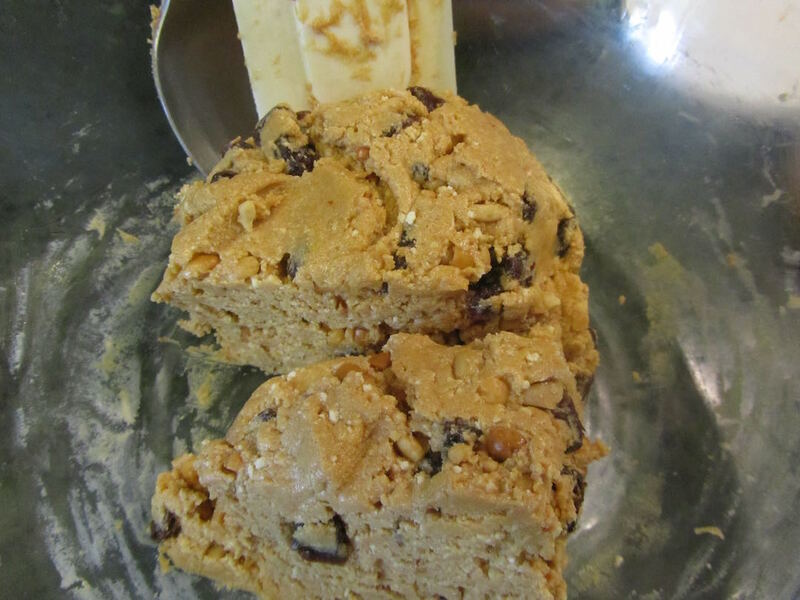 In a large bowl, stir together peanut butter, milk powder, honey and raisins. Divide "dough" into quarters, then each quarter into 6 portions (yielding 24 portions all together). Roll between the palms of your hands into balls. Then roll each into your dry and flakey stuff. Refrigerate. Some people roll these in melted chocolate, for a healthier confection. Also yummy. But as I was looking for a snack replacement and not a candy-type item, I used homemade granola. One of the aspects of making these products at home that I like is this -- if I buy a commercial product, once that box is empty, they're gone. But if I buy the ingredients to make something comparable, once the final item is eaten, I can turn to my pantry and make another batch. Or, and also appealing, I can use those same ingredients in other recipes. Never thought about putting instant dry milk in the blender, but it's a good idea because I certainly wouldn't want to bite into a lump of it. Good luck to your daughter with her weight. I am glad you are able to help her with that so she can concentrate on school. Thank you. I've felt blessed to be available for her as much as she has needed. Supporting her through this has meant a lot to both of us. I think that this brings up an important issue in frugal homemaking. If your budget will not budge, clearly you have to buy what you can afford, and nothing more. But how you choose to spend those dollars and cents should be a balance of plain old economy of volume (especially for a big family like yours) and getting the most nutrition you can for the money you're spending-- especially if you have health issues within your family. I admire your emphasis on wholesomeness and variety, as well as your straight-up frugality. Even if your homemade energy balls had cost a few cents MORE, if they were healthier and would work better for your family-- not just empty junk calories --they would be a better investment in those pennies you spent. And you might actually need to spend less on other items during the day, if these are doing their job more efficiently. I also love making our own snacks and other substitute items because we know exactly what's in them-- both type and quality of ingredients. If I could buy a lot of something pre-packaged cheap, but it's of so-so quality, I'd actually rather make my own of very good quality, freshness, etc., and ration it out. It's worth it to me to work a little bit harder at stretching my pennies for our other home-cooked meals than spend our hard-earned money on cheap food that maybe isn't worth eating at all. We think that our home-made versions of snacks actually taste better than the store-bought ones, too! There's a certain satisfaction to by-passing the manufacturers of snack foods. It's so easy to be "fooled" into thinking that factories has more to work with -- more equipment, "special" ingredients, somehow something that we don't have at home. But you and I have talked about this, how practically everything we can buy was once made in someone's basement, kitchen, garage or tool shed. I love how we can go online and find recipes for just about anything we need/want to make. And you can taste the love put into homemade -- don't get that with commercial goodies! Your homemade snacks probably DO taste better, as they are freshly made, and haven't been sitting in a cardboard box for months! When my daughter was little (she is now 33) she used to watch Mister Rogers' Neighborhood on PBS. He had a similar recipe but not as nutritious as yours. Make into balls and roll in graham cracker crumbs. Oh how I miss Mr. Rogers. He was one of my favorite television persons! And I vividly remember Chef Brockett, too! His peanut butter balls do sound good. The nuts would give extra protein and good fats. I hadn't thought to add chipped nuts. I may do that, maybe with almond meal, one of these times I make them. Lili your recipe sounds good. I have some peanut butter that needs to be used up and a hubby that works long hours. Will give this a try. also, check out Alana's recipe. If you are short on honey, the Mr. Rogers' version doesn't call for honey at all. Hope your husband enjoys these! One of the side benefits is they're a bit like cookies (size, portion and sweet-wise), BUT no baking -- which is wonderful in hot weather! My husband only recently discovered a similar recipe but also called Energy balls. He uses a protein powder (that raises the price quite a lot) and no raisins because we don't like them. 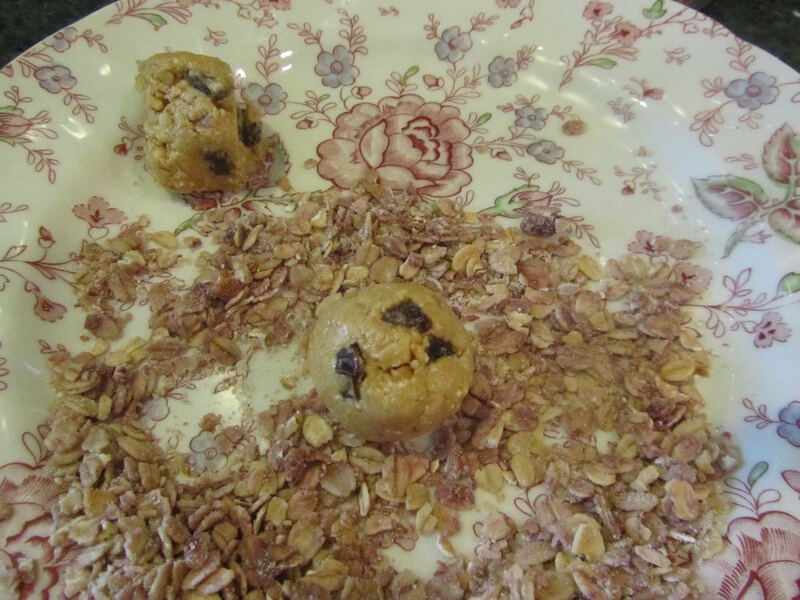 His recipe has the oats right in the mix along with mini chocolate chips and chocolate protein powder. The balls are not rolled in anything but just by themselves. He freezes them and pulls out several for an afternoon snack at work. Not sure what your/your husband's particular health needs/restrictions are, but our son's last year of university, we wanted to replicate a peanut buttery bar we had been buying. High protein and plenty of good fats were our two big nutritional goals. oh, yum! The chocolate chip version does sound particularly yummy! And the protein powder would definitely add more nutrients, depending on what's in his product. I can cut and paste the entire recipe's ingredient list and enter the servings, and voila, instant nutrition facts per serving. It also gives a "grade" for the recipe, which isn't always helpful to me, as I have different nutrition goals (like gaining weight, eating more fat) than what the site thinks the average consumer should be consuming. But that's okay. I just need the calorie count and I can do the figuring if the kind of calories are what we need. With kids, my kids always liked helping with these. And it's totally something they are able and safe to do. No ovens. And they feel proud to help. For us, I need to monitor carb intake, and also protein and calcium. I ran my bean burger recipe through the calculator, and thankfully one pattie is under the 17g carb that my (diabetic) daughter requested, actually came in 13g total - 3g dietary fiber = 10g net carb per pattie. Now I can offer the patties to her with assurance. Protein was 3g, calcium 2%, and 119 calories per pattie. Not bad for 10c worth of nutrition. This is net carbs 11g and 4g protein. Actually this little ball has more protein and calcium, and comparable carb as the bean pattie. This would be a good snack for my daughter as well. Thanks! !